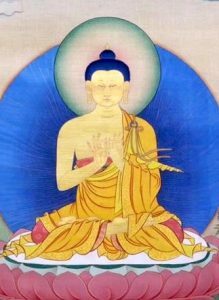 Through the natural compassion innate to dharmakaya and sambhogakaya, nirmanakaya forms emanate in accordance with the propensities and aspirations of beings in the six states of existence, just as wherever water gathers the moon’s reflection can be seen. As an emanation of Vajrasattva, Prahevajra is such a nirmanakaya, appearing as the first human lineage-holder of the Dzogchen teachings. He was born, amidst many auspicious signs and predictions, to a nun who was the daughter of the royal family of Uddiyana. At age seven and without having studied, he entered into a philosophical debate with five hundred scholars, the most skilled in the royal court and defeated them all. He was recognised to be a nirmanakaya emanation and the king subsequently named him Prahevajra (Delightful Vajra). Afterwards he meditated on a mountaintop until the age of thirty-two when, in a blaze of light, Vajrasattva (or, according to some accounts, Vajrapani) bestowed upon him the empowerments, instructions and entrustment of the Dzogchen Tantras. He attained the stage of ‘no more learning’ and Vajrasattva granted him permission to commit the Tantras to writing. And so, with the help of dakinis, he spent three years transcribing the teachings he had received. He spent the rest of his life in Sitavana, a famous charnel ground northeast of Bodhgaya, where he meditated and taught the Dharma to dakinis, many hundreds of thousands of whom attained the rainbow body. When he died at the source of the Danatika River, his body dissolved into immaculate space amid masses of rainbow light. His main disciple, Manjushrimitra, was overcome and cried out to his master. Suddenly, Prahevajra appeared in the sky within a mass of light and with the sound of a thunderclap, a tiny golden casket descended into the palm of Manjushrimitra’s hand. Within it he found the last testament of Prahevajra, Tsiksum Nedek (The Three Lines That Penetrate the Essence), written in blue malachite on a leaf. Thereafter these teachings of the Inner Tantras and Dzogchen were transmitted in the human world through the ‘Oral Lineage of Exalted Human Individuals’ and their respective texts were gradually established. Although appearing as human beings due to the perceptions and needs of their disciples, many of these teachers were in fact buddhas or bodhisattvas, as in the case of Prahevajra and Padmasambhava. Because of this, some presentations of the ‘three forms of transmission’ class the lineage from Prahevajra to Padmasambhava and Vimalamitra as being part of the ‘Symbolic Lineage of the Awareness Holders’, with subsequent lineage masters belonging to the ‘Oral Lineage of Exalted Human Individuals’. Others present the ‘Oral Lineage of Exalted Human Individuals’ as beginning with Prahevajra.